Peterborough Sports players aim to be celebrating again tomorrow. Peterborough Sports attempt to reclaim top spot in Division One Central of the Evo Stik Southern League tomorrow (March 23). Sports host mid-table Barton Rovers at the Bee Arena (3pm). A win would take them top providing second-placed Bromsgrove Sporting don’t beat third-placed Corby Town. Yaxley could do with a win at home to AFC Dunstable. The Cuckoos are now just three points clear of the drop zone. 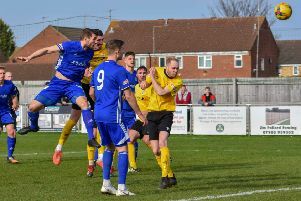 Spalding United host Stocksbridge Park Steels in a relegation battle in Division One East of the Northern Premier League. 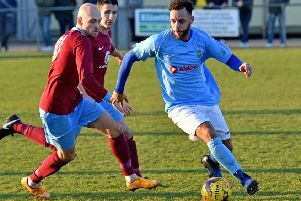 Deeping Rangers are at home to sixth-placed Cogenhoe United in the United Counties Premier Division. Deeping are currently nine points behind leaders Daventry, but they do have a game in hand. Peterborough Northern Star seek to snap a 12-game Premier Division run without a win at fellow strugglers ON Chenecks. East Division: Ossett Utd v Wisbech Town, Pickering Town v Stamford, Spalding Utd v Stocksbridge Park Steels..
Division One Central: Peterborough Sports v Barton Rovers, Yaxley v AFC Dunstable. Premier Division: Deeping Rangers v Cogenhoe United, Eynesbury Rovers v Pinchbeck United, Holbeach United v Rothwell Corinthians, Northampton ON Chenecks v Peterborough Northern Star. Division One: Birstall United Social v Bourne Town, Lutterworth Town v Huntingdon Town, Northampton Sileby Rangers v Blackstones. Division One North: Swaffham Town v March Town United.